For the past six years, TakingITGlobal has collaborated with the Adobe Youth Voices program to make an impact on the lives of youth around the world. Our Partner Appreciation Events continue this month as we journey around the globe to celebrate the partnerships, the creativity, the passion, and the impactful digital media that has been the outcome of the past few years of AYV. TakingITGlobal has been honoured to work in delivering the AYV program to deserving and outstanding sites all over the world. 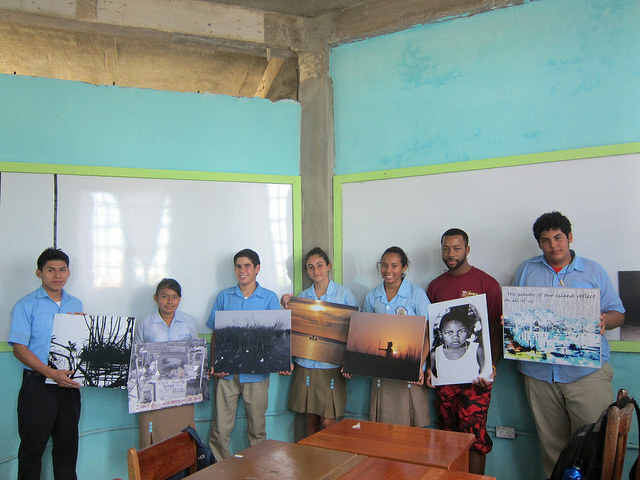 Our AYV Appreciation Event in Belize brought us to the sandy shores of Caye Caulker. This tropical island is known as a tourist getaway. Despite the easy-going appearance, the inhabitants of Caye Caulker have had to overcome their own set of challenges. Eight years ago, the island did not have a single high school for their youth meaning that students interested in pursuing their education had to take a one hour boat ride to the main land each way or had to be shipped off to boarding school. Both of those options were costly and not an ideal situation. 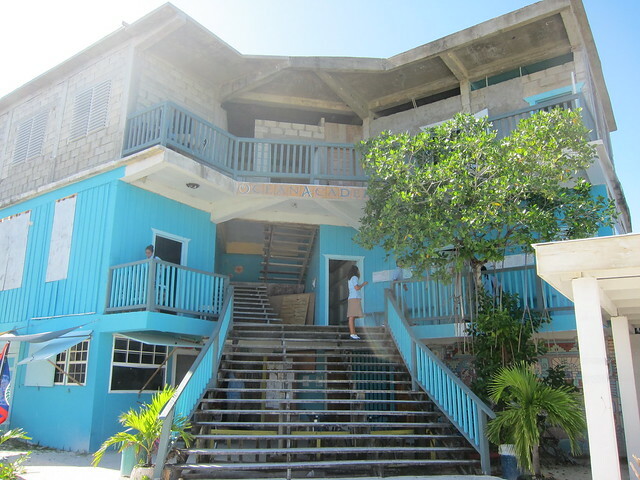 In 2007, Ocean Academy opened its doors as the first secondary school on the island. It took a lot of dedication and perseverance to arrive to where they are today with a fully functioning high school full of lively and passionate students. This contagious energy has extended to the Adobe Youth Voices program. It is evident that the students of Ocean Academy are driven to follow their passions. After completing the year as the AYV Youth Ambassador at Ocean Academy, Matthew, has decided to continue pursuing his fascination with digital arts. His focus is now on using digital media to create special effects. Although Yvon has now graduated from Ocean Academy, we were grateful that he was able to return for a visit to attend our AYV Appreciation event. Yvon was one of the most enthusiastic and dedicated students of the AYV program. It is clear that he took great pride in his work and he mixed his passion for digital arts with the other loves of his life: his family and his island. While a participant of the AYV program, he created stunning and moving pieces. He decided that he would continue to follow his dreams and enrolled in post-secondary education focusing on commercial design. This was made possible due to the Adobe Youth Voices Creativity Scholarship that Yvon received last year. 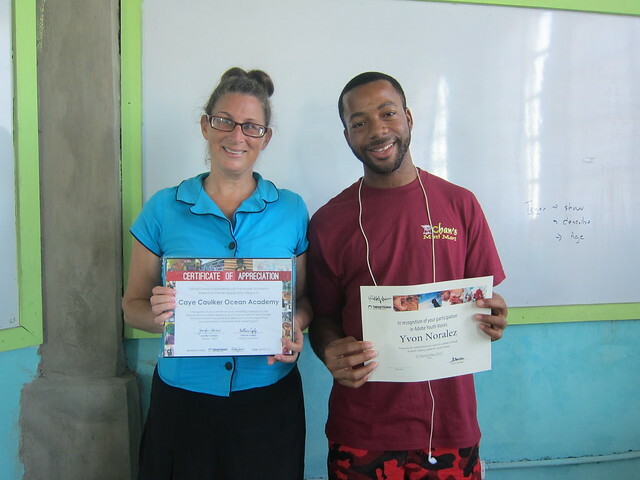 Yvon was quick to express his gratitude for everything that he learned through the AYV Program and for the much needed support that he earned by winning the scholarship. The scholarship provided him with an opportunity of a lifetime. Currently, Yvon works hard to stay on top of his studies while also working a part time job and volunteering to teach traditional dance classes to local children on the weekends. He is an inspiring example of the type of motivated and energetic youth that is characteristic of the AYV Program. Now that you have become acquainted with the context of Ocean Academy and the type of youth that are representative of this site, we are ready to dive into the celebration! In the spirit of youthful festivity, the Ocean Academy AYV Event took on the form of a pizza and gelato party. This was a departure from the student's’ daily routine of rice and beans. The AYV youth and educators gathered in an empty classroom during their lunch period. 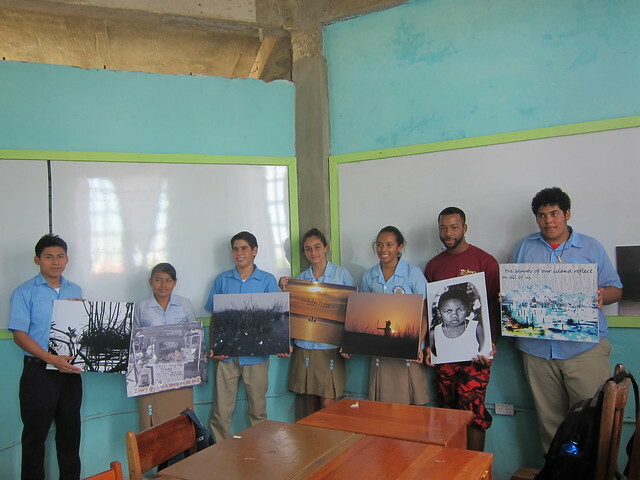 Prints of their AYV art pieces surrounded us on the walls of the classroom. Over mouthfuls of pizza and spoonfuls of tropical flavoured gelato, the youth recounted their inspirations and stories for creating their media pieces. Some pieces were created through a process of careful thought and consideration, while others were produced through a more natural and spontaneous method. Regardless of the means, the end always resulted in an expressive and meaningful piece. We took a moment to recognize the efforts that participants and educators alike devoted to this program by presenting certificates to each individual and a plaque to Ocean Academy. Of course, none of this would have been possible without the tireless and eager efforts put forth by our wonderful AYV program lead educator, Joni Miller. Her excitement to see her students succeed and to express themselves creatively is very evident. She has played a key role in making this program possible on Caye Caulker and we are filled with gratitude to have had her onboard. Joni pointed out that it was on account of the AYV Program that Ocean Academy was able to provide access to digital media to their students that they would have otherwise not been able to acquire. 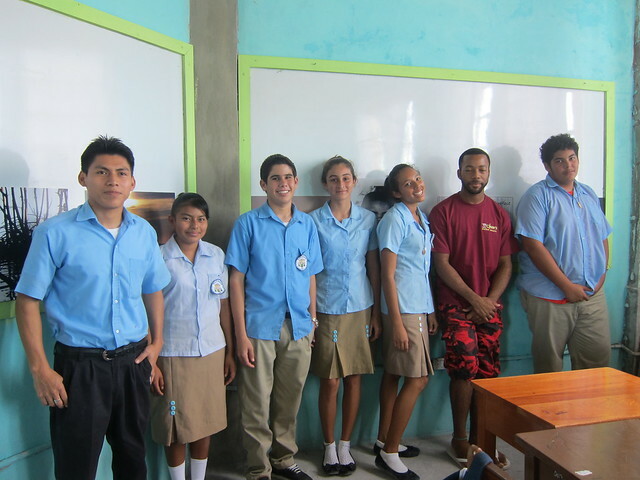 We are wholeheartedly thankful to have been able to work with Ocean Academy through the AYV Program. Our celebrations are meant to extend our sincerest gratitude to all of the educators and participants from these sites for their participation and dedication to the Adobe Youth Voices Program. We recognize the meaningful work that is being by Ocean Academy and and we are honoured to be a part of the process where youth can express their voices on the issues that matter the most to them.